KUALA LUMPUR (Sept 19): Tun Dr Mahathir Mohamad said he is “a little worried” about the tendency of “very rich” Malaysian institutions to invest abroad by purchasing and constructing properties overseas. In particular, the former Prime Minister has singled out the Employees Provident Fund (EPF) as an example. “The biggest [institution] is of course the EPF. Instead of supporting local industries, they have gone abroad. To a certain extent, this is desirable … [but] if we have too much outflow, it would not be good for our economy,” he said when speaking to reporters at the 6th Malaysian Construction Summit 2014 today. EPF is allowed to invest 23% of its funds outside Malaysia. As at end-2013, approximately 21% of its total investment assets are global assets. But not all of its global portfolio is in real estate investments, although this has been growing over recent years. According to Mahathir, local institutions placing investments worth billions of dollars overseas would cause a serious outflow of funds from Malaysia. “We [should be] very concerned about the flow of money, whether it is flowing out or if it is flowing in. If we have money flowing out, it means we will have a deficit. That may be reflected in the government spending because you may have to borrow,” he said. “When we go outside the country to buy properties, they are immovable. Whatever you put into that property results in an outflow of funds. This, we should be very careful about,” he added. Credited for the “Look East Policy” and the ‘Malaysia Boleh!’ concept in the 1980s, Dr Mahathir also expressed his “regret” over the lack of confidence in Malaysian contractors. According to him, this is evident in the government’s decision to overlook local construction players in favour of foreign firms for some of the country’s most ambitious projects despite the “tremendous progress” in the local construction scene. “There was a tender for a building which was over 100 storeys high and Malaysian contractors and architects were not even invited to tender for this building. This is very sad because it would have given us the opportunity to build or at least, design the building,” he said. “The building next to the twin towers [Petronas Tower 3] … the contract was given to foreigners. I am sure Malaysians would have worked with these foreigners. So, they [Malaysians] should be given a chance to build these tall buildings,” he added. 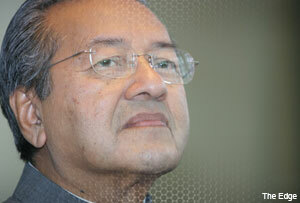 Besides, Mahathir also appeared unimpressed with the idea of a 100-storey skyscraper in Kuala Lumpur. “The problem with all buildings is that once you build a tall building, someone wants to build one that is higher. There is a race and I think the Gulf states will win this hands down because they have a lot of money left over after selling their oil. “I don’t think we should compete with them although there is already competition in Malaysia. Someone wants to build a building that is higher than the twin towers,” he said. On a separate issue, Dr Mahathir also criticised the government-backed fund, 1 Malaysia Development Bhd (1MDB, for its plans to sell some RM8.4 billion worth of Islamic bonds, calling it “borrowed money”. “Borrowed money cannot be regarded as sovereign wealth fund … When you want to spend money to build up assets in the country or outside the country, it must not be from borrowed money. It must be from surplus. We have no surplus,” he said. Current Prime Minister Datuk Seri Najib Razak chairs 1MDB’s advisory board. If 1MDB’s mega sukuk plan materialises, it will the world’s biggest Islamic bonds offering in 2014. But, it will also add on to the company's mounting debt of RM38 billion. These comments followed Mahathir’s already vocal and public display of unhappiness towards the Najib administration. While he admitted that his comments were “annoying” to some quarters of the government, the former premier said he felt inclined to make “nasty” remarks when the government’s decisions do not contribute to the economy. He argued that Malaysian leaders need to be criticised based on their performance in order for them to improve and he will be "nasty, when necessary."